At NBZ Apparel, our stories are your stories. 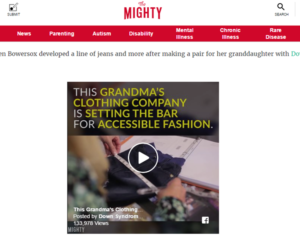 We invite you to read some of our social good impact and adaptive clothing news stories below. We welcome any feedback or questions. Share them if you like. Finally, please check back often. Thank you for all you do to make these, OUR stories, possible! It all started when Karen Bowersox noticed her granddaughter, Maggie, who has Down syndrome, had trouble finding jeans that fit her. After customizing jeans for Maggie, Bowersox created Downs Designs, selling clothes designed for people with Down syndrome. Bowersox quickly realized her jeans could help those with limited use of their hands or upper bodies. “I’ve realized that jeans without buttons or zippers don’t have to be limited to men with Down syndrome.” Seeing the need for more accessible options, Bowersox expanded Downs Designs into NBZ Apparel. Even from an outsider’s perspective, it doesn’t take long to identify a central focus in William Herron’s life — service. Herron currently serves as the marketing director for both Downs Designs Dreams and NBZ Apparel, a for-profit social good enterprise strengthened by investor backing. Created with a mission to aid typical body types who are faced with dressing challenges, the NBZ brand was constructed with soft, stretchy, sensory-friendly material and elastic waistbands with no buttons, zippers or tags. For every three pairs sold, NBZ Apparel will donate a pair to that cause. All veteran cause donations will directly go towards Downs Designs Dream’s Support-A-Veteran Program. 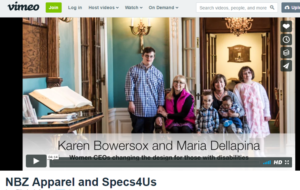 Five Minute Focus on Karen Bowersox and Maria Dellapina; Women CEO’s Changing the Design for Those with Disabilities. 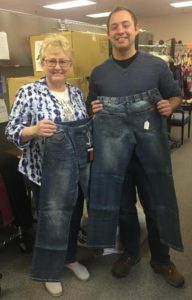 Continuing their social good impact and community support NBZ Apparel donated 140 pairs of NBZ Boy’s jeans to The Hope Chest of Lake County. The Hope Chest is an all-volunteer based organization dedicated to a mission of providing clean clothing and new shoes to school children in Lake County. Their focus is that all children may attend school with dignity and pride. NBZ Apparel Aims to Help Wounded/Disabled Veterans and People Living with Disabilities by Donating 1,000,000 Pairs of Our Life-Changing pants! A one-of-a-kind social good apparel maker and on-line clothing retailer. NBZ Apparel belongs to a special category of businesses committed to making a difference in the world. 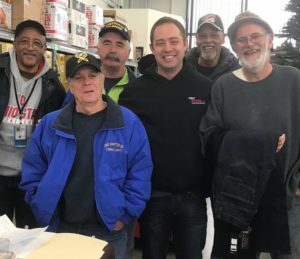 To expand its social good impact and veteran support, NBZ Apparel has donated 25 pairs of NBZ jeans and khaki pants to Downs Designs Dreams’ Support-A-Veteran Program. The recent donation completed a request for veterans within Milwaukee’s Zablocki VA Medical Center. NBZ Apparel, known for adaptive wear, was at the event to donate pairs of jeans and khakis to each veteran. William Herron, marketing director for NBZ, said the company helped support the Vietnam Wall in Perry. Were are always is looking for ways to help more veterans. “I was in the military, which is why all these things are passionate to me,” he said.